Students will need some guidance from the instructor to frame their observations. This activity has been modified from the original GLOBE poster and activities, and offers additional background and instructions. Although the 2007 data may be dated, this activity is more about recognizing patterns in spatial data. This approach of teaching with data is valid and useful. This a skill-based activity that focuses on having students recognize patterns in global data sets. This skill is important for critical thinking while analyzing large data sets and data-based imagery. The activity can be used with data on the GLOBE poster or with any data set. 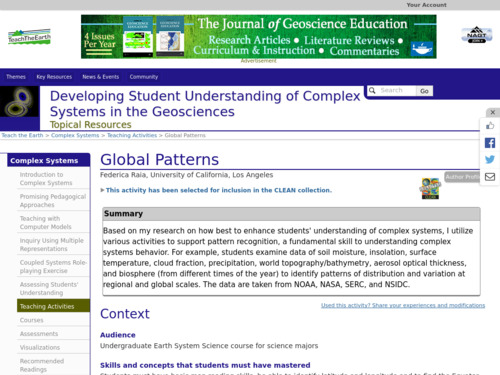 Comments from expert scientist: This activity provides a broad overview of the Earth System. I see this as a strength compared to other ways of presenting the material such as going into detail on each Earth System component but then missing the big picture. The process of formulating hypotheses is critical to the scientific method. In this activity, students are pushed to develop their own hypotheses. This activity uses a jigsaw approach to have students work in small groups while observing data-based imagery. The activity does not contain specific handouts or instructions, so it will need to be tailored by the instructor. Poster and Activity can be found here http://www.globe.gov/do-globe/for-teachers/earth-system-science-posters - this link is broken on activity website. This activity is more of a description of an approach rather than a completely prescribed activity. Instructors will need to provide their own student handouts.